Preheat the oven to 375F. Sift the flour and salt together and set aside. Beat the butter and sugar on medium speed with a paddle mixer until the mix is fully incorporated but not overmixed. Continuing on medium speed, add egg to the mix and for a few seconds until incorporated. Then add molasses- again just until incorporated. Reduce speed to medium-low and add the flour-and-salt mixture 1/2 cup at a time until fully incorporated. The dough is now ready to roll out and cut. Roll the dough to 1cm thickness onto a sheet of parchment paper and cut out the shapes for the roof and pool surround with a sharp paring knife. The roof is in the shape of an L. The dimensions are as follows, starting with the longest side: 14” x 9” x 4” x 5” x 10” X 4”. If you’re having a hard time visualizing it, just draw it out. The pool and the all-important hot tub are comprised of five pieces. 2 strips of measuring 8"x 1/2", 2 strips measuring 3" x 1/2 strips, and an L-shape piece measuring 1.25"x1.25" and 1/3" thick. 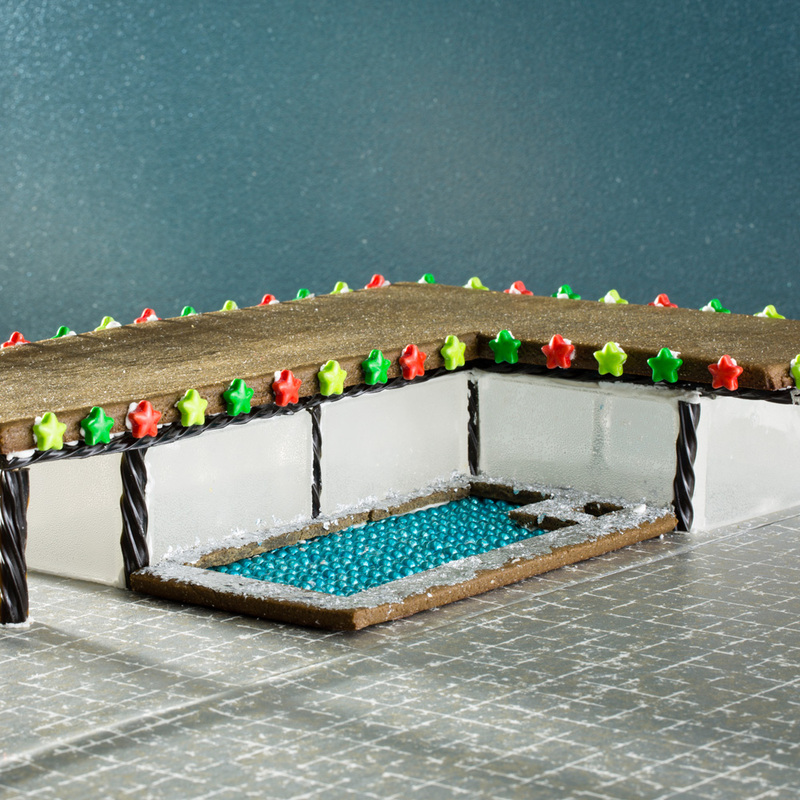 Bake the gingerbread two rounds- the roof in the first round for 12-15 minutes and the pool pieces for 7-10 minutes or until firm. When you pull the pieces out of the oven, it’s best to run over them gently with a rolling pin to flatten them out. Using a knife and working carefully, you can coax or trim to straighten out any bulging edges or wonky shapes. Sift cream of tartar and powdered sugar together and set aside. Whip together egg and about half of the powdered sugar on low speed in a stand mixer until fully incorporated. Increasing to medium speed, add remaining sugar/tartar mixture a 1/2 cup at a time, allowing the the mix to come together between additions. Turn the mixer up to medium-high speed and let the icing whip for a few minutes until it holds stiff peaks. If the mix is too stiff, add water 1 teaspoon at a time. If the mix is too runny, add additional powdered sugar 1 tablespoon at a time. Place isomalts in a microwave container and microwave for about one minute, or until the isomalt completely liquified with a water-like consistency. Remove isomalt and let bubbles dissipate. Do not aggressively stir or tap. Just be patient. Wearing gloves to protect your hands, pour liquid into a silicone baking mold with 3.5” x 2” rectangular reservoirs. You’ll need ten window panes, each about 1/2" inch thick each. Allow molds to cool completely and pop them out.